Del Webb's Spruce Creek Preserve in Dunnellon, Florida is located on 416 acres of rolling countryside and surrounded on three sides by Ross Prairie State Forest. It is an ideal environment for those seeking an intimate community in a beautiful, natural setting. This age-restricted and gated community, designed for those 55 and better, provides residents with an active lifestyle, lovely homes, and various social clubs. Spruce Creek Preserve was built by Del Webb and is known for its beautiful golf course and welcoming community. Residents are invited to join some of the many social clubs, take fitness or craft classes, or even volunteer to help run the community. There is plenty to do within the community, and nearby Ocala provides residents with additional shopping, dining, and cultural opportunities. Golf is a major attraction at Del Webb Spruce Creek Preserve in Dunnellon, FL. The Preserve Golf Club boasts a championship 18-hole golf course, designed by Terry Doss, which provides unique challenges for both beginning and experienced golfers. The Preserve Golf Club also offers a golf pro shop, golf lessons, and a casual dining restaurant, Sandwedge Cafe. Yet golf is only the beginning at Spruce Creek Preserve. 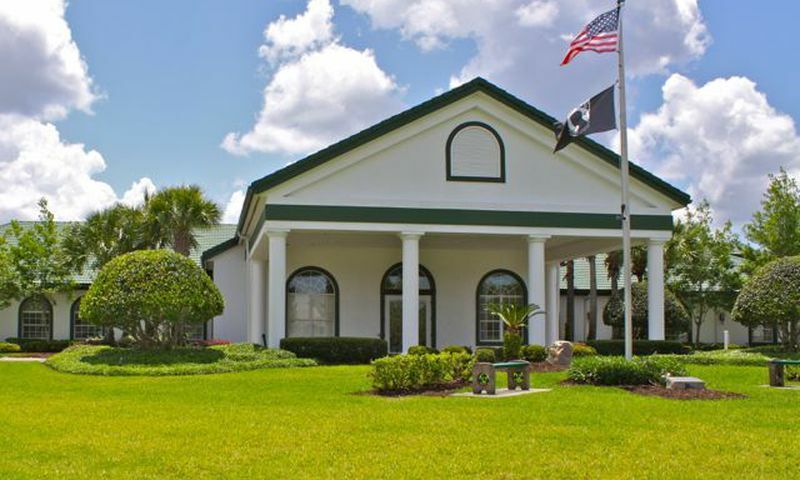 Spruce Creek Preserve offers a wide variety of amenities at the clubhouse, such as arts and crafts room, card room, billiards room, and a ballroom. The fitness center provides both exercise equipment and classes. Residents can also make use of the community's computers, library, and RV parking. Spruce Creek Preserve is ideal for residents who appreciate active living and the splendor of the great outdoors. A heated outdoor pool, tennis, bocce, horseshoe, basketball courts, and shuffleboard courts are available for friendly competitions among neighbors. The community landscaping is mature yet manicured, with flowers that bloom throughout the year and live oaks dripping with Spanish moss that residents can appreciate while taking a stroll on the walking or biking trails. Spruce Creek Preserve's intimate community of 810 homes built by Del Webb are set among the lush beauty of the championship 18-hole golf course. Single-family homes range in size from 820 to 1,968 square feet with two or three bedrooms, one or two bathrooms, and an attached one or two-car garage. Residents love these homes for their low-maintenance exteriors and great single-level living. Spruce Creek Preserve appeals to active adults who enjoy living life to the fullest in a setting rich with natural beauty. The many social clubs, events, and activities will interest a variety of residents. Fitness classes, including golf lessons, and craft lessons are designed for both beginners and more advanced students. Those who wish to help with the governance may opt to work with the homeowners association or volunteer for one of the vital community committees. There are many social clubs at Spruce Creek Preserve, which encourage residents to stay active and meet new people. Just a few of the popular groups include: Aristocrats Club, Coffee Social Club, Bingo Club, Garden Club, Jet Sets Singles Club, Preserved Players Drama Club, Friends of the Library, Midwest Club, and Sunshine Club. Spruce Creek Preserve is 10 miles from Ocala, Florida in Marion County, which is considered the "Horse Capital of the World". The thriving horse industry provides residents with many opportunities for riding or visiting horse farms. In nearby Ocala, residents can find dining, shopping, and cultural events. Downtown Ocala's "Brick City" offers more than 20 shops and restaurants in a charming historic setting. Though the community has a rural setting, there is easy access to Highway 200, about three miles west of State Road 484. Spruce Creek Preserve is a great active adult community in Central Florida. Villas offered in the community range from 820 to 1,296 square feet of living space with at least two bedrooms, one bathroom, and an attached garage. Homebuyer looking to downsize will love these models and their well-designed floor plans. Single-family homes offer 1,383 to 1,968 square feet of living space with two to three bedrooms, two bathrooms, and an attached two-car garage. These models were designed for active adults with single-level living and low-maintenance exteriors. We are very happy with our home purchased in SCP just a year ago. It's a great retreat for us for the winter months. Very friendly residents. Highly recommend! ? We bought our home in April 2015...we love it here! Everyone we've met have been friendly and welcoming! We wanted a gated community with a reasonable HOA and we found it! We're back HOME !!! Moved back here after 12 years. Love it here. Everyone is so nice here. So quiet and safe. We researched the Central Florida area for a 55+ community using 55Places.com and other resources. In the fall of 2014 we came to Florida and went to several communities in Leesburg and Ocala area. After seeing Spruce Creek Preserve, we knew it was on the top of our list of potential home sites. In The spring of 2015, we sold our home in New England and came to Florida. We purchased a home in Spruce Creek Preserve in early May. Spruce Creek Preserve is a financially solid, HOA owned community. The homes are a good value for the North Central Florida area. The people we have met in the area are very open and friendly. We are happy with our decision to choose Spruce Creek Preserve. We lived in Spruce Creek since 1998. Until recently would have rated this to be a great community. We have an RV storage area, which we pay for. adjacent is an RV temporary parking area for guests of residence. Resident manager and board of directors says that "any size vehicle" can park in this area. This, apparently includes 70ft 18 wheel commercial vehicles, who knows what they have as cargo!! This isn't what I understood, but apparently it's of no concern. We lived here in 2002! Moved back to KY near family. Plan to move back to Fla sometime in the future. Would live no where else!! This is a great place to live. We knew of this place many years ago when we first lived in Florida. Turns out to be a great place to live. It's gated for privacy, it's nice and quiet and it's got all the nice amenities like the clubhouse, fitness center, pools, golf and restaurant. Plus, the homes are very reasonably priced. 55places.com is not affiliated with the developer(s) or homeowners association of Spruce Creek Preserve. The information you submit is distributed to a 55places.com Partner Agent, who is a licensed real estate agent. The information regarding Spruce Creek Preserve has not been verified or approved by the developer or homeowners association. Please verify all information prior to purchasing. 55places.com is not responsible for any errors regarding the information displayed on this website.